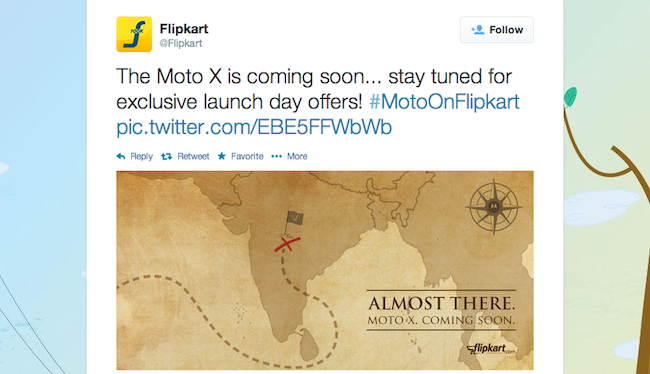 After the runaway success of the exclusive launch of the mid-priced Moto G smartphone by Flipkart, the e-commerce giant is now gearing up to launch its big brother Moto X in the Indian smartphone market - just like we had hinted in our previous story (read here for more). Same as before, the smartphone will be launched exclusively on Flipkart.com, and the company will also be providing a number of launch day offers to woo in potential buyers. Early last month, Flipkart had started booking for Moto G on Feb 6, 2014, with the 8GB and 16GB models being available for Rs 12,499 and Rs 13,999 respectively. Within minutes of the launch in the morning, the 16GB model was sold out, while only a few units of the 8GB version were left. The company re-stocked the device around the afternoon, only to see it being sold out again. The rush was so much so that the site even went down for a couple of minutes on the day of the launch. "We cannot comment on the exact numbers, but we sold thousands of units in a couple of hours. The high demand that we are witnessing for Moto G among Indian consumers has gone beyond our expectations. The traffic that we are seeing on our site post the launch has exceeded what we experienced during our Diwali sales. This is unprecedented," Sachin Bansal, co-founder and CEO, Flipkart had said at the time. First and foremost, the most distinguishing factor of the smartphone- the online studio Moto Maker- will not be available to customers in India. For those who don't already know, Moto Maker enables users to customise their Moto X devices with over 2,000 possible combinations. The customisation options include colour of the smartphone (both front and back panel), wallpapers, signature (engraving a short message on the device), accessories and accent colour, among others. Also, only the single-SIM version of the device is coming to India. In addition, customers will not get to choose between 16 and 32GB of internal memory options, since only the former will be available to customers in the country (which is a little odd, if we must say). This smartphone has a 4.7 inch HD AMOLED touchscreen display (720Ã—1280 pixels resolution) and runs on the latest Android 4.4 KitKat operating system (out of the box). It is powered by a 1.7 GHz dual-core Qualcomm MSM8960Pro Snapdragon processor and has 2 GB RAM. The internal memory of the device is 16 GB, and the company is also providing 50 GB of Google Drive storage free of cost for two years. Moto X has a 10 mega pixel autofocus rear camera with LED Flash that can record full high definition videos (1080p) at 30 frames per second and a 2 MP front-facing camera that can also record full HD videos. There is also a provision for automatically launching its 'Quick Capture' camera. You can touch anywhere on the screen and the camera captures the shot you want. According to the company, the smartphone's high quality sensor can capture the darkest scenes or stop motion blur in bright light. You'll see the difference in every shot. Moto X measures 129.3mm x 65.3mm x 10.4mm and weighs 130 gm. Additional features include Touchless Control (allows users to check the weather, get directions, among others) and Active Display (keeps the important information you need at your fingertips by displaying it on the screen). Although Flipkart has not but an exact date of launch, considering the 'coming soon' tag, we predict it to be somewhere in the third or fourth week of this month. And while Motorola is yet to put a price tag against Moto X in India, we feel it will lie in the under Rs 25,000 range, considering the fact that the company had reasonably priced Moto G last time around- one of the prime reasons for its success.